What is it that tips you over the edge and how do you keep from getting there? Personally, I find that it's not one thing in particular that sets me over the edge, but often whatever little thing occurs when my filter and my resilience are completely shot. Stubbing my toe. Dropping something (and even worse, having it break). The 800th time the dogs bark at something on the TV when I'm trying to zone out and watch something mindless. Losing something. Burning something. Forgetting something. And to top it all off, doesn't it seem infinitely more maddening when you realize that something so silly sent you over the edge? Sometimes it's that fact alone that gets me! While I am generally referring to the point at which you put your hand to your forehead and collapse dramatically onto the couch Southern belle style, I do want to say that if this point goes deeper, feels more serious, or puts you or anyone else in danger, then please ask for help. While most of us are able to keep ourselves from reaching this point, there are times when we may not see it coming, or simply have chosen to ignore it until it's too late. 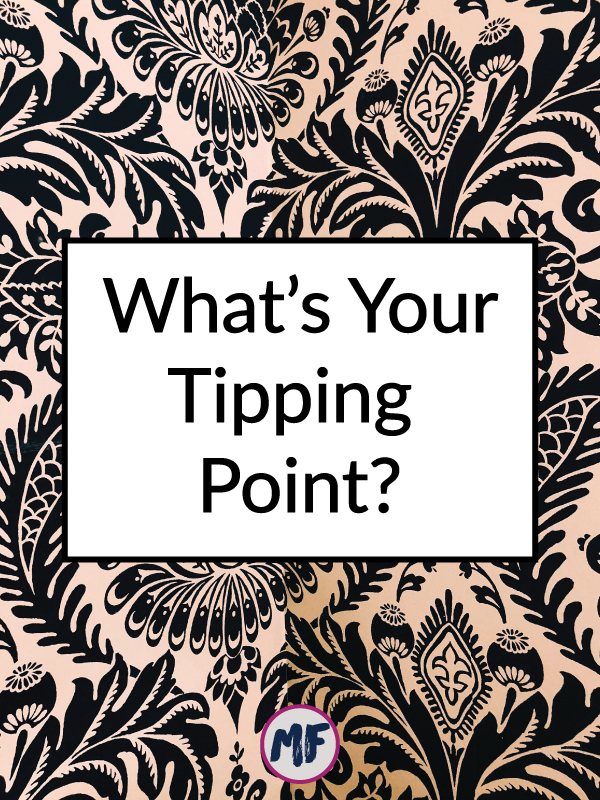 Serious health concern or not, I encourage you to find an outlet for your frustration and negative feelings before you reach your tipping point. Whether it's taking the time to practice some self-care (whatever that looks like for you), asking your mother-in-law to come watch your kids for an hour so you can go for a walk alone, rallying your closest friends for coffee and just talking (personal anecdote - I had a three hour coffee/breakfast date with two of my closest friends on my birthday this year and it was one of the best things ever - I also recognize that not everyone has time for things like this, but if you can make it happen...do it), or deep cleaning your house at 10pm on a Sunday night. If you find yourself getting increasingly annoyed, frustrated, or angry with increasingly minor setbacks or annoyances, it definitely might be time to take a step back and consider how you can address whatever is causing you to creep towards "the edge." This brings up another point that might seem out of place here, but I think it's worthy of addressing. We, as women, need to stop making each other feel bad for not being able to do it all or for not always having it together. I'm not a mother so I can't speak to that, but I do still feel the pressure (self-imposed or otherwise) to get it all done with no complaints and no struggle along the way. The truth is that we all struggle, and rather than making anyone feel bad for admitting that or feel bad for asking for help, lend a hand or an ear and lift each other up. Tell me, what's your tipping point?